This course can be used as part of the National Registry of Emergency Medical Technicians Refresher Course for all levels of EMTs. In conjunction with EPC and PHTLS will comply with NREMT as a Refresher Course. 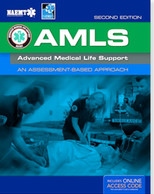 Advanced Medical Life Support - AMLS is a classroom, PowerPoint, instructor-led course from the National Association of Emergency Medical Technicians that teaches students treatment programs that offers a "think outside the box" diagnosis methodology and is endorsed by the National Association of EMS Physicians. This course emphasizes the use of scene size-up, history, interactive group discussion on potential treatment strategies, and physical exam to systematically rule out and consider possibilities and probabilities in treating patient's medical crises. PowerPoint-based course to ensure continuity, consistency, and "out the box thinking"
CERTIFICATION: Upon completion of this course, students receive an NAEMT Advanced Medical Life Support course certificate and completion card that is valid for 4 years.